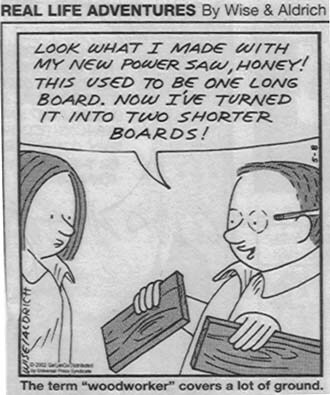 One of My Favorite Cartoons: I keep the cartoon shown below hung on the wall in my shop. It tends to keep things in proper perspective. This hobby is supposed to be fun! Comments about this web site: I thoroughly enjoy woodworking, and I also enjoy building and updating this site. It provides me a place to catalog finished pieces, tool reviews, ww links, and other opinionated mumbo-jumbo. I've also heard from many woodworkers that it's provided them with a bit of guidance, and that's fantastic. Feel free to send me an email with any comments or criticism (constructive or otherwise) about this site. I love hearing from visitors. Another motive for this site is to maintain a database of pictures of my tools for insurance purposes. My ISP has a good backup program, and I know that if anything ever happens to my house the pictures will still be available for assistance with insurance claims. This site contains no advertising. Zero. Zip. Zilch. Nada. None of my work is for sale, and I have no plans to go pro or do any major commissions, so there are no ulterior motives in these pages. You can browse without fear of being sold something blatantly or subliminally. I personally created this site entirely using Notepad for html authoring. I know barely enough to build basic web pages, but I find them much cleaner than my initial attempts with Front Page, Word, and other canned html authoring tools. You won't find any fancy java encoding, animations, or pop-ups here - partly because I don't know how to do that stuff and partly because I want this site to be simple and straightforward. Lately I've been using an open source program called Nvu to update the site, and I'm finding it to be very handy (and very free!). Earlier site updates can be found on this history page. Feedback: Enjoy exploring, and feel free to provide feedback via email!